As a biker, when ever I think about America, the first picture that comes to my mind is thunderous choppers, moving slowly through a long stretch, rattling every door, window and soul around. Well, thanks to the numerous Hollywood flicks I've been watching since child hood. First look at the 2010 Hyosung ST7 tells me that it's not only I who has this perception about America, Hyosung also thinks the same. 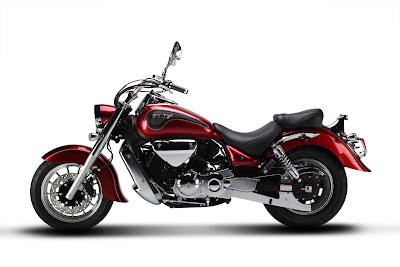 The ST7 has all the right ingredients to be called as an American Chopper - V Twin Engine, Low Slung Seat, Twin Exhaust Pipes with Slash Cut tips, Back Swept Bars. Hyosung has tried to give the bike an all American retro persona with, lots of chrome, huge retroish fenders back and front and head lamps, large rear view mirrors and smaller wheels. 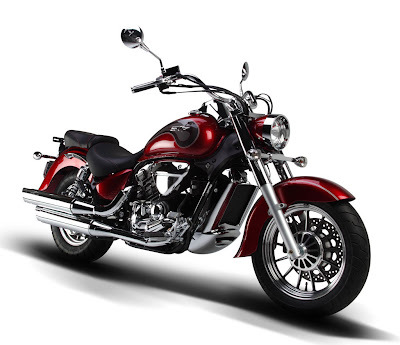 Again, to add to the retro aura, Hyosung decided to do away with conventional wheels, but did it with style. The wheels are cast from aluminum with multi-spoke design which actually looks good. One thing which I would have loved to see is, instead of going for 80 section tyres, Hyosung should have go for 60, the 80 section looks a bit out of shape. True to a chopper character, the ST7 sports an out slung 33.0° of rake angle and 66.9 inch of wheel base. One might think that moving that along might be a pain, but thanks to the smaller wheels (16 inches up front and 15 inches at back), handling is quite nimble for this 244 kg bulker. The seating is quite roomy for tall and small riders alike, thanks to 675 mm seat height, and comfortably placed foot pegs. The seat is red stitched, broad and is quite comfortable for long rides. 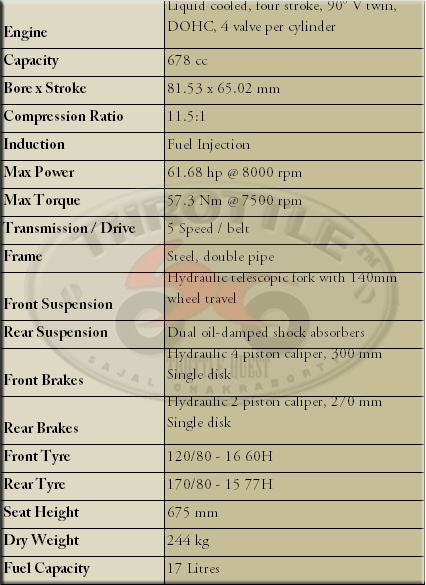 Coming onto the performance bits, the revvy 678 cc motor of the ST7, provides ample low end punch, even though the peak torque of 57.3 Nm at crank coming at 7500rmp might seem coming a bit high on the rev scale for a chopper. 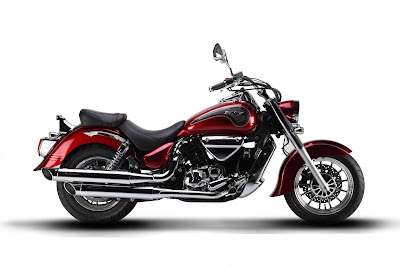 The 61.68 hp of peak power, relayed by belt to the rear wheel provides adequate punch to not only keep up with the traffic, but also zoom past ahead of most four and two wheeled companions. But as was the case with GT 650R Fi, as we go higher in the rev range, vibes start ghosting up through the handle bar and the foot pegs, which might become annoying, specially so, when cruisers like the Suzuki Intruder et al have set very very high standards, well of course at the price of a hefty price tag. Other than a hint of notchiness, the transmission is smooth and crisp. Well, like the GT 650R Fi, the ST7 also suffers from some short falls, which undermines an otherwise great bike. First thing that comes to one's notice is the gearing. Considering the engine vibes which creep in high in the rpm range, one very badly feels the need of a proper 6th gear. Said that, the very absence of a proper six gear assembly baffles my logic. The Electronic Fuel Injectors are not up to standards and the throttle response is not consistent, specially when we climb up the rev range. Definitely they leave open the doors for further tuning. The skinny feeling of the clutch and the brake levers also fail to provide that muscular feeling we otherwise associate with choppers. The levers feel picked directly from any other street bike rather than having been custom made for the ST7. Also, the clutch engagement is not quite smooth and feels like the bike has subjected to abuse from the word go. The quality of the paint is good, but the plastic used in the instrumentation and the way the wiring has been handled looks cheap and does not let you associate yourself with riding a premium class chopper. The few shortcomings that the bike has can easily be ignored or can be modified given that the price tag is very tempting. But as is the case with the GT 650R, everything boils down to how Garware Hyosung decide to well market and support the bikes.